Over the July 4th weekend a large group of people boated out to Sand Island, which is about a mile off the coast in Mobile Bay in Alabama. There they set up tents and volleyball nets and began to play. 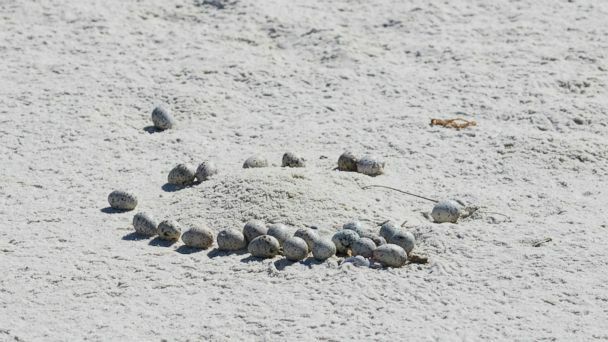 However, there were many bird nests and eggs in their way, so they cleared enough space for their games. Sadly, their actions led to the death of many young coastal seabirds. These particular birds, called least terns, are federally protected. The headline of the article I read said: “Beach volleyball players in AL accidentally kill hundreds of birds. Switch that scenario to human embryos and see if the logic would hold true. Would the headline have said that humans were killed? I doubt it. I wish that baby humans in the womb were federally protected. “For you created my inmost being; you knit me together in my mother’s womb.”—Psalm 139:13. This entry was posted in Christian Living, Culture, Current Events and tagged abortion, bird eggs destroyed, created in the womb, federally protected birds, illustration, pro-life, Psalm 139:13. Bookmark the permalink.